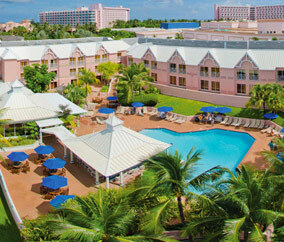 Enjoy fun, sun, and fine dining at the Comfort Suites Paradise Island. This affordable, family-friendly hotel provides guests with all the luxurious amenities you’d expect in paradise: newly renovated suites with flat screen TVs and free Wi-Fi, an outdoor pool featuring a swim-up bar, complimentary hot breakfast, and full access to the pools, water park, river rides, private beach, and health spa and the famed Atlantis resort. Members receive up to 5% cash back off room rate after stay plus kids stay, play, and eat for free. Comfort Suites hotels recently underwent renovations for a refreshed look and feel across its many locations. Now guests can enjoy more space, more amenities, and more of what they want for a stay they’ll never forget.